Winter is coming (it had to be said), and I'm trying a little test on overwintering a couple 5-frame nucs. I don't normally insulate my hives because I don't think it's necessary in my area. Bees can maintain their heat within a cluster just fine. However, things might be different in these small nucs. The cluster is much closer to the walls of the hive. My hypothesis is that the cluster loses more heat due to the proximity to the cold walls in a nuc than they would in a 10-frame hive. (Think: standing against an uninsulated window on a cold day vs standing a few feet away.) So the test here is to decrease heat loss through the side walls (the ones they are most likely in contact with) and see how it improves things. The features here are, double-thick foam insulation on the roof (like last year). 1-inch thick foam insulation on the sides. A corrugated plastic rain roof with a drip edge on the front. The hive is tilted forward to promote water runoff on the inside ceiling, so it doesn't drip on the bees. Ventilation holes in the bottom and top box. Everything is taped together with white duct tape (not very pretty, but that's not the point). 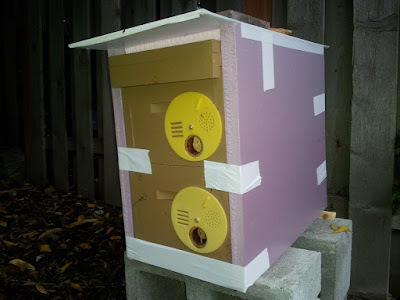 Of course there are many factors that go into hive winter survival, so if these 2 hives die it may be hard to know if the insulation helped or not. But I'll let you know how things turn out next spring.